Contrary to popular notion, you really don’t need to break the bank when buying engagement rings. A lot of couples make the mistake of overspending on a ring and end up with a huge debt before starting their life together. Thankfully, there a plenty of affordable engagement ring options that look just as good as expensive ones. In this post, we reveal the 5 rules you shouldn’t break if you want to stay within budget when buying a ring. This is a very important step that will help you stay within budget. Go to an online jewellery store and explore several ring options and make a note of their corresponding prices. This should give you a rough idea of how much your budget should be and what are the types of rings you can get spending that money. It’s always important to set a realistic budget, something that’s affordable yet sufficient enough to get you the ring you want. If you are on a budget, going to a physical jewellery store is a big mistake. Here’s why. Jewellery store executives are trained to upsell. They will use every trick in the book to try and make you spend more than should. It’s also important to note that some jewellery stores simply do not feature budget rings. For example, many stores do not have titanium band options or have cubic zirconia rings. When you buy online you get a lot more variety, especially if you are looking for budget engagement rings. If you cannot afford to buy an 18ct gold engagement ring, then there is no reason to worry. There are plenty of other affordable metal options that look really beautiful. For starters, you can buy a 9ct yellow gold engagement ring, which closely resembles the look and luxuriousness of pure gold. Cobalt engagement rings are also growing in popularity. Cobalt is a shiny white metal that can be crafted to feature curvy shapes and flowing designs. For reference, an average cobalt engagement ring usually costs less than £100. Other affordable metal options include white gold rings and titanium engagement rings. A single large piece of diamond drives up the price of an engagement ring. If you don’t want to look for non-diamond options, then buying a ring with a cluster of small diamonds can save you some serious dough. Look for pieces that feature a cluster of small diamonds that are positioned to create a large centrepiece or arranged in a line. These diamonds are usually pretty small, sometimes as small as 0.15ct. However, a single ring can feature as many as 30 of these tiny diamonds and still be available at an affordable price. There is no rule that says you need to buy a diamond ring for your engagement. If you don’t want to spend too much and have no fascination towards diamond, then consider buying a cubic zirconia engagement ring. These gemstones closely mimic the look of a real diamond and costs just a fraction. Women often spend hours selecting that “perfect” ring for their weddings. They have their own set of parameters, which usually include gemstone carat and metal purity. Buying wedding rings for men, however, is a whole different beast. At the cost of mass generalisation, men like to keep things simple and practical. Most men have no experience wearing any kind of jewellery. Therefore, comfort and fit are two very important factors when selecting wedding rings for guys. If you are a would-be bride trying to shop for your man, then this guide is definitely for you. Without further ado, let’s check out 5 of the most common mistakes people make when picking up a wedding ring for a man. Going to a Jewellery Store: A lot of women do like to spend hours going from shop to shop before stumbling upon something they like. While there are exceptions, most men simply don’t have the patience to do that. This results in one of two things. Guys end up hastily picking up anything that they remotely like or they simply call it quits and head home. Another reason not to go to a jewellery store is that rings there are grossly overpriced. According to one particular account, a particular NY jewellery store quoted $300 for a carbon fibre ring, the same ring was later spotted on an online store for just $25. Considering men have no problem browsing aimlessly on the internet, comparing prices and shopping for men’s wedding rings online makes much more sense. Not Exploring Cheaper Metal Options: A lot of men prefer value over exclusivity, functionality over luxury. Men also value things that are extremely durable and strong. Considering these personality traits, common metal options such as platinum and gold can be a bit too fancy for some men. Titanium, on the other hand, is a metal that men can relate to. It’s a natural metal that almost has a grey gunmetal finish. Titanium is also extremely durable while being significantly cheaper than expensive metal options such as gold and platinum. Explore cheaper and high-strength metals such as tungsten carbide and palladium. If your man doesn’t like metal, consider looking up carbon fibre and ceramic wedding rings for men. Splurging Too Much: This is a pretty common mistake. Men often don’t like to overspend on the same things women do. If you are planning to shop for your man, it’s best to set a budget first. 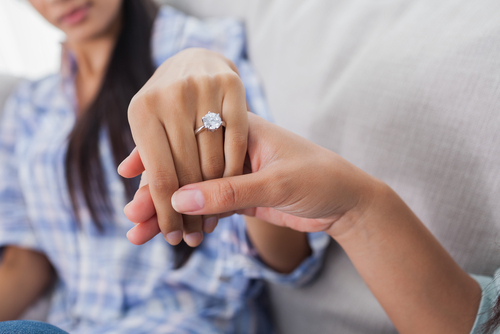 Have an open conversation about wedding rings and find out how much he is willing to spend. Overlooking Comfort: Unless your man loves bling, he probably has no experience wearing rings. Most men experience a few weeks of teething period when they start off wearing their wedding rings for the first time. A lot of men have been known to shelve their rings for “safekeeping” just because they couldn’t bear wearing them any longer. To ensure that doesn’t happen, it’s best to buy a ring that’s resizable. It’s also highly recommended to buy a metal that’s hypoallergenic. Not Considering His Professional Occupation: Wearing rings while operating heavy machinery can lead to nasty injuries. It’s called ring avulsion and it happens quite frequently. This happens when the ring gets caught in a moving part of a machine. If your guy is a construction worker, metal worker, or anyone who works near machines and motors, it’s best to size the wedding ring so that it slides off easily. This will allow the guy to take off his ring quickly and easily before heading to work. Got Engaged? 6 Reasons why you’re the best thing that ever happened to him!